I have a special place in my heart and stomach for brownies, oh how I love a warm chocolate brownie with a scoop of vanilla ice cream. So delicious. 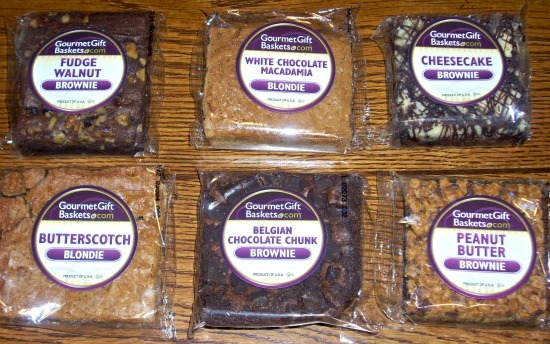 When I was given the opportunity to review the Brownie Sampler from Gourmet Gift Baskets I couldn't say yes fast enough! I had done a review for Gourmet Gift Baskets not too long ago and had seen all the great products they carry on their site but seeing the Brownie Sampler made me love this site even more. If you are looking for the perfect gift for the sweets lover in your life, this is the best gift to give them! I received six brownies, individually wrapped, Belgian Chocolate Chunk, White Chocolate Macadamia Blonde, Butterscotch Blonde, Cheesecake, Peanut Butter and Fudge Walnut. I was impressed that they were not thin, dry or burnt, which are the three biggest mistakes that can easily happen to brownies (in my opinion). I was in brownie heaven and so was my family! I was kind and shared my brownies with my family, we are a family of seven, counting my parents, nine. I cut the brownies up into bite size pieces to get everyone's opinions. It was a thumbs up on every single brownie and we are a tough group to please! The Belgian Chocolate Chunk was my absolute favorite but that was because the more chocolate the better in my book. My middle daughter was in love with the Butterscotch Blondie and my husband was partial to the Peanut Butter one. Gourmet Gift Baskets really hit this one out if the park! Whether you are throwing a baby shower, birthday party or office party the Brownie Sampler is the perfect addition to any special occasion. Enter below for your chance to win this great Brownie Sampler! Sorry this one is only open to the lower 48 states.